What do you think of when you hear the word casting? My first response is to think of casting for fish with a rod and reel. One of the reasons that I am no good at fishing is that I stink at casting. The same goes for casting my burdens. In my last post, I mentioned that I struggle with consistency in my commitment to trust the Lord with my problems. I tend to give Him my cares, but then break my promise to trust by worrying. It is due to my problem with casting them, and then leaving them with Him. Committing to trust God requires an all in approach, but casting our cares requires a hands-off approach. Otherwise, the problems for which we so desperately need help stay with us and not in His care. A friend once told me about a process for casting cares. She said to imagine putting my problems into a balloon filled with helium, and then letting go, allowing them to soar upward into heaven for God to take over. I liked that imagery. I thought that it would help solve my difficulties with casting; however, what I found was that although I am great at putting problems into the balloon and letting go, I tend to reach up and grab hold of the string before it gets away. Casting is the opposite of keeping, though. It means to throw or place upon. In that sense, the balloon imagery will never work. We can never cast our cares into a balloon and expect them to ever land upon heaven’s shores. The journey is too far, and the temptation to grab them back too great. We need to get rid of them quickly. To Someone nearby. God is that near One. 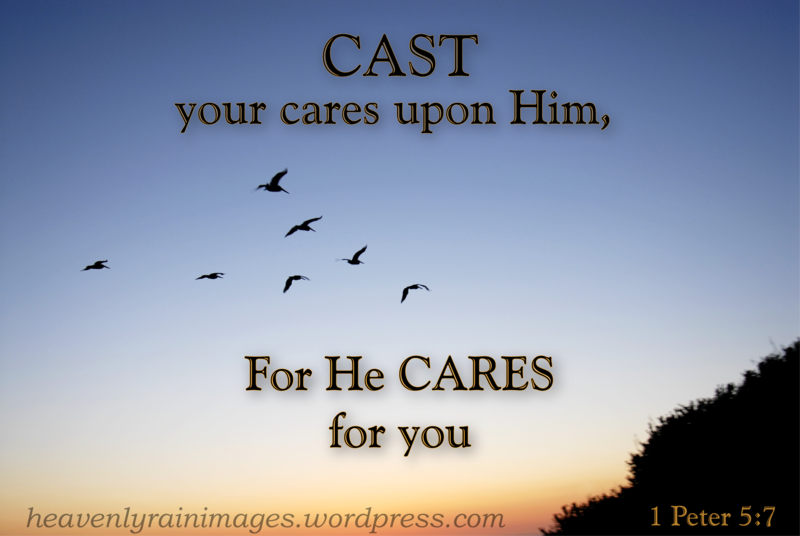 Our Savior cares deeply for what bothers us, and longs for us to release our burdens to Him. He is ready, with arms open wide to handle them. Why then do we insult Jesus by taking them back by worrying? Do we really believe in His power to handle them? Are we persuaded? With our words, we may tell God that we trust Him, but when we take them back by fretting our actions speak differently. They declare a lack of persuasion in His powerful capabilities, and we must stop doing this. Any parent will agree with me that when a child says he is going to do something, but does not follow through, it is very upsetting. All talk, but no action renders their word meaningless. The same is true when we disobey in the area of casting our cares. I am someone who values commitment, but my inconsistency in trusting God with my burdens breaks my vow to Him. Since I am imperfect, I will likely continue to struggle from time to time. However, knowing how offensive this is to Him makes me more determined than ever to prove my commitment, by casting my cares upon the Lord and leaving them there. To be persuaded that He is able. Amazingly, when we surrender our problems to Christ, they transfer instantly to the throne room in heaven, without us having to do anything but hand them over! He takes care of what concerns us, because He cares so deeply for us. This entry was posted in Random Thoughts on October 29, 2013 by heavenlyraindrops. Thanks! I needed this. I’m going through some things now and I tend to worry about it. Yes we need to cast out burdens on Him, but still need to be responsible to work those things out. It’s a matter of trusting Him and always asking Him to help us. Yep. Gotta have his help. Thanks, Stephen. I think, too, of casting seeds when I think of casting. Although I still worry and fail to completely cast my cares upon Jesus sometimes, I’m getting better at remembering His works of love and provision in the past to make it easier to trust Him in the present and future. Beautiful, peaceful image! Sue: Thank you for this encouragement. As His followers, we are called to trust Him, and as you say, we must be fully persuaded that He will catch us when we fall and will take those cares that we cast in His direction. I find that when I am tempted to draw my problem back to myself that singing helps (it usually doesn’t begin worshipfully) 😉 but I don’t stop singing His praises until His reassuring peace washes over me. What a wonderful suggestion. Praise and worship does that. Thanks for stopping by, Jacquie. I think of casting as in fishing, you cast your fishing line as far as you can, Of course the reeling it in imagery doesn’t work, but I do love the idea you bring up here. Love the photo too.